Jack's second overnighter with the Beavers! This time it was the District Camp with Cubs and Scouts there too, the BIG one! We knew we were going to be late because Jack had his first swimming lesson the same day and time that camp started, but we got him there just under an hour late so that's not too bad. He had an awesome time though. His friend Rory came this time. 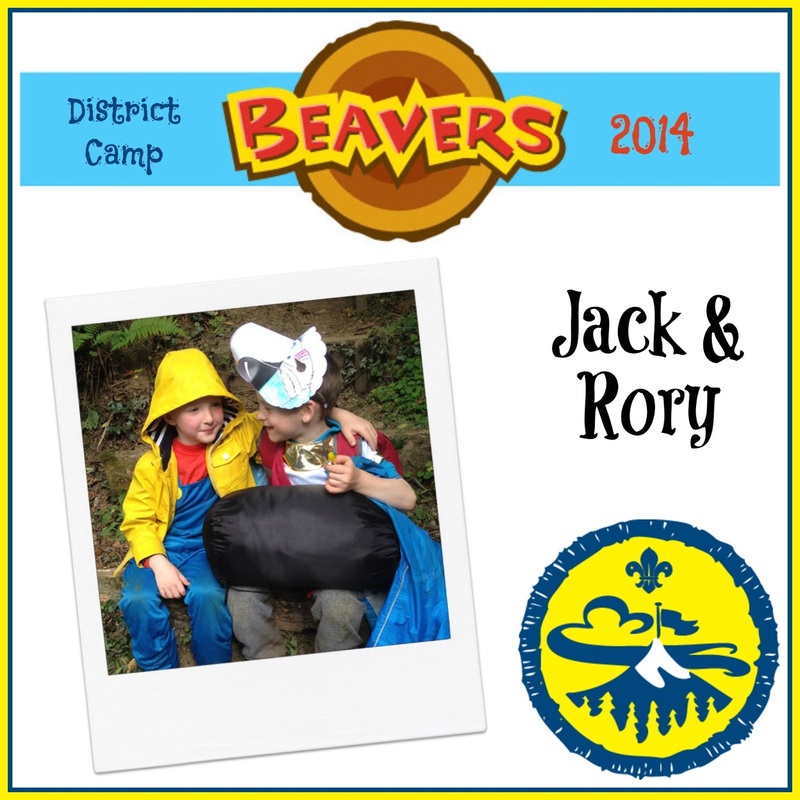 Rory was Jack's best friend back in his Nursery days and we've managed to keep in touch despite them both being in different schools now and Beavers is a great way to make sure they see each other every week. Now... getting Jack to tell us anything he's done while he has been away from us is difficult. Finding out what he's done at school is like pulling teeth, so expecting him to be able to tell us everything he did at camp is a bit of a stretch. But He did manage to tell me that they had played in a field, been one some huge bouncy slides and castles and stuff, and had a go at archery. He also told me that he had woken up very very early in the morning and had a "warning" about chattering and giggling when people should be sleeping - the warning was that he would get his mouth duck taped! I laughed so hard when he told me that and I said it was a great idea, we had some duck tape at home. He pouted. It must have been good though because he was fast asleep well before we got home, and he was missing half his stuff. In fact he was wearing the same clothes as the day before, right down to the same undies and socks turned inside out! He said he and Rory "might have been a bit silly" and chucked their bags about. He lost his clothes and had to wear his dirty ones. I have since spoken to Rory's mum who seems to have wound up with a whole lot of extra laundry... Mystery solved. I am led to believe that he has achieved badges, such as the Adventurer Badge (like in that piccy up there) but I'll have to wit for him to be Invested in a week or two as the next meeting is at the University not the Scout Hut. Sounds stupid (Hubby rolls his eyes when I say it) but I'm so excited for him and I can't wait to get sewing these badges into his jumper!